Pranic Healing is an ancient science and art of healing that utilises prana or life energy to heal the whole physical body. In general, the body is capable of healing itself at a certain rate. Pranic Healing works on the principle that the healing process is accelerated by increasing the life force on the affected part of the physical body. Using a no-touch methodology, Pranic Healing is applied on the bio electromagnetic field known as the Aura, which is a mould or blueprint that surrounds and interpenetrates the physical body. This energy body absorbs life energy and distributes it throughout the physical body to the muscles, organs, glands, etc. A cure is effected by simply removing diseased energies from the patient’s invisible energy body and by transferring prana to the affected areas with the use of the hands, crystals, breath work and visualisations. Pranic healing can provide relief and healing for acute and chronic ailments, as headaches, fever, colds, digestive troubles, arthritis, high blood pressure, and psychological imbalances, stress, anxiety, depression, phobias, addictions and other related ailments. Marc is an advanced Pranic Healer who studied at the Ashish Institute Of Inner Studies under the guidance of Grand Master Choa Kok Sui and teacher Dr Hazel Wardha. He has successfully completed the courses in Advanced Pranic Healing, Crystal Healing, Psychic Self Defence and Pranic Psychotherapy. Reiki is a Japanese word representing universal life force, the energy around us and within us. Reiki is a way of activating, directing and applying natural energy for the promotion of Health. Through the use of touch, healing energies are drawn down into the body and treats the whole person, including body, emotions, mind and spirit. Reiki is a powerful method to help the body in releasing stress and tension through deep relaxation and is wonderfully gentle and nurturing. Reiki practitioners are trained in applications of the Reiki energy, and are attuned to access the energy at will. Our whole energy field, including our physical body, is responsive to thoughts and feelings. The flow of energy can become disrupted or even grind to a halt whenever we acknowledge negative thoughts and feelings about ourselves, whether this be done consciously or unconsciously. 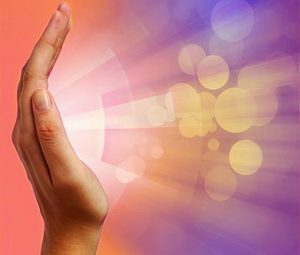 Reiki is a hands-on technique which connects you to universal life force energy which helps to remove these disruptions by flowing through affected parts of the energy body and the aura, and to recharge them with positive energy which assists to clear and balance the body’s energy field. Marc is a Reiki Master and organises Reiki workshops, contact the Centre for more information.